Sarri said his side have improved from earlier in the season, when they would "immediately concede" in difficult moments. "In the past we were not able to suffer in the difficult moments of a match," said the Italian. They were sloppy in possession from the first whistle as Sarri made seven changes from Monday's dominant victory over West Ham in the Premier League. Captain Simon Deli almost handed the hosts an early lead when he headed Miroslav Stoch's free-kick inches wide at the back post. They almost snatched a goal moments before Alonso's winner when Ibrahim Benjamin Traore produced a fierce shot at goal, but Kepa Arrizabalaga leapt to his right to save well. Jindrich Trpisovsky's side forced Chelsea into mistakes and they will draw confidence from their impressive performances on the road against Genk and Sevilla in the previous rounds. No side has kept more clean sheets in the Europa League this season than Chelsea (8 - level with Arsenal). Chelsea had two shots on target in the match - the fewest they have managed in a Europa League game this season. Since his Chelsea debut in September 2016, Chelsea's Marcos Alonso has scored more goals in all competitions than any other defender (17). Match ends, Slavia Prague 0, Chelsea 1. 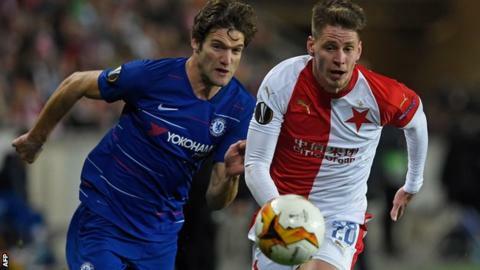 Second Half ends, Slavia Prague 0, Chelsea 1. Ibrahim Benjanim Traore (Slavia Prague) wins a free kick in the defensive half. Offside, Slavia Prague. Ondrej Kolar tries a through ball, but Mick Van Buren is caught offside. Corner, Slavia Prague. Conceded by Ruben Loftus-Cheek. Foul by Josef Husbauer (Slavia Prague). Corner, Slavia Prague. Conceded by Jorginho. Goal! Slavia Prague 0, Chelsea 1. Marcos Alonso (Chelsea) header from the centre of the box to the bottom left corner. Assisted by Willian with a cross. Vladimir Coufal (Slavia Prague) is shown the yellow card for a bad foul. Substitution, Slavia Prague. Mick Van Buren replaces Peter Olayinka. Attempt saved. Jan Boril (Slavia Prague) right footed shot from the centre of the box is saved in the bottom left corner. Attempt missed. N'Golo Kanté (Chelsea) left footed shot from the centre of the box misses to the left. Assisted by Olivier Giroud with a headed pass. Olivier Giroud (Chelsea) wins a free kick in the attacking half. Dangerous play by Simon Deli (Slavia Prague). Substitution, Slavia Prague. Josef Husbauer replaces Lukas Masopust. Attempt missed. Simon Deli (Slavia Prague) right footed shot from outside the box misses to the right. Attempt missed. Vladimir Coufal (Slavia Prague) right footed shot from the right side of the box misses to the left. Attempt missed. Jan Boril (Slavia Prague) left footed shot from the right side of the box misses to the left. Assisted by Jaromir Zmrhal with a cross following a corner. Corner, Slavia Prague. Conceded by Kepa Arrizabalaga. Corner, Slavia Prague. Conceded by Marcos Alonso. Attempt saved. Ibrahim Benjanim Traore (Slavia Prague) right footed shot from outside the box is saved in the top left corner. Assisted by Lukas Masopust. Foul by Alex Kral (Slavia Prague).